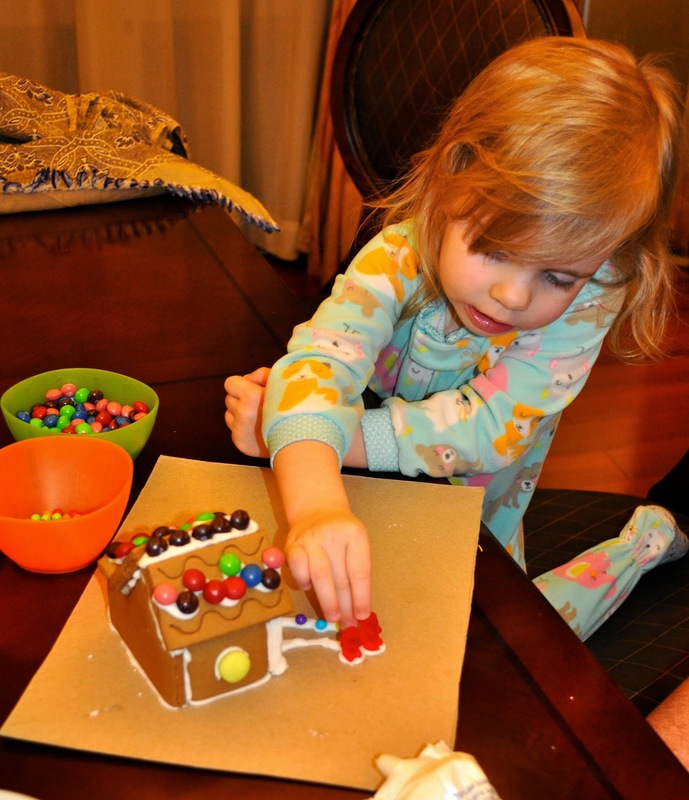 One of the children's most favorite things to do at Christmastime is to make gingerbread houses. Before we left the US for China, Kenny had the genius idea to buy several gingerbread house kits. I know we could make gingerbread from scratch, but getting molasses is no small feat and what I can find I like to use for making gingerbread cookies -- another holiday tradition. And, frankly, the kits are SO convenient, apart from the fact that the icing was too old to use and the candy that came with them was hard as rocks. But, I whipped up a new batch of royal icing (one of the only reasons why my spice cabinet has cream of tartar) and supplemented with some leftover Halloween candy and we were in business. The kids had a ball, though I think at least Claire ate more than she used in her decorating. She certainly has a sweet tooth, but I'd be lying if I said she didn't come by that honestly! This particular kit came with 5 miniature buildings, (only one of which was slightly damaged, miraculous indeed! ), perfect for everyone to have a chance to get in on the decorating fun. Claire's finished product, see the ice skaters? Isaac's two structures. The one on the left is the "Chalet." Doesn't all that red and green tinted snow look inviting? Caleb took a more minimalist approach and paid particular attention to the symmetry of his decorating scheme. I think their gingerbread houses perfectly reflect their personalities. Our Gingerbread Village - good enough to eat (apart from the fact that this particular kit is almost as old as Claire! ).